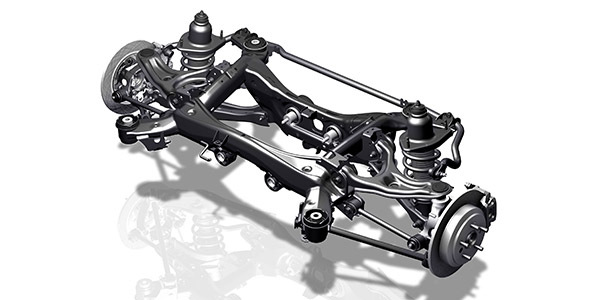 You might assume that the Honda Ridgeline shares a lot of the same components as the Pilot. Aside from the general proportions, the Ridgeline is a different vehicle made in a different plant. The brakes on the Ridgeline are robust and have very few problems with noise or pulsation. Where the service issues can be found are with the parking brake and hydraulics. The parking brake on the Ridgeline is actuated using a pedal. The cable goes from the pedal to the equalized bar that is mounted near the driver’s-side doorsill. The cables come out near the fuel tank and the EVAP canister. The parking brake is a drum in hat design that can be adjusted through a hole in the hat of the rotor. Press the parking brake pedal with 66 lbs. of force to fully apply the parking brake. The parking brake pedal should be locked within 10 to 12 clicks. Minor parking brake pedal adjustments (1 to 2 clicks) can be made with the adjusting nut on the pedal. To perform the adjustment, lift the vehicle. Release the pedal and press the pedal one click. 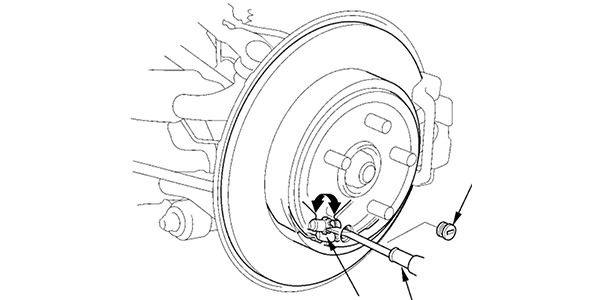 Tighten the parking brake adjusting nut until the parking brake drags slightly when the rear wheels are turned. Release the parking brake pedal fully, and check that it does not drag when the rear wheels are turned. Readjust if necessary. 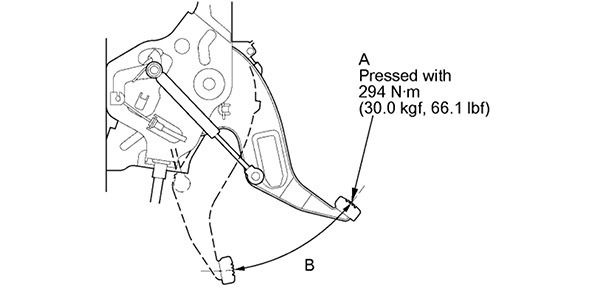 If a larger adjustment is required, perform a major adjustment using the adjuster nut at the parking brake drum. Remove the access plug in the rotor. Turn the ratchet teeth on the adjuster nut with a flat-tip screwdriver until the shoes lock against the parking brake drum. Then, back off the adjuster 10 clicks and install the access plug. One of the more common complaints is brake pedal feel. To test the master cylinder, with the ignition switch in LOCK, press the brake pedal several times to deplete the vacuum reservoir, then press the brake pedal hard and hold it for 15 seconds. If the brake pedal sinks, either the master cylinder is bypassing internally or the brake system is leaking. Inspect the brake hoses and lines. To test the brake booster, start the engine with the brake pedal pressed. If the brake pedal sinks slightly, the vacuum booster is operating normally. 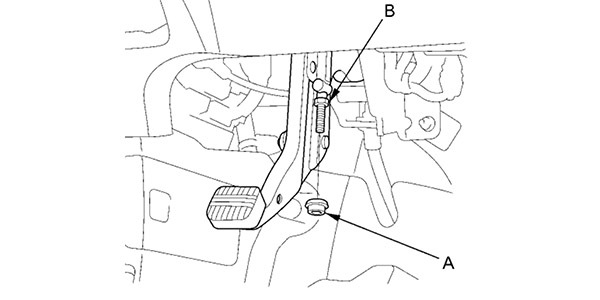 If the brake pedal height does not vary, perform the brake system test to see if the master cylinder is the problem. Press the brake pedal with the engine running, and then turn the ignition switch to LOCK. The brake pedal height should not vary while pressed for 30 seconds. If the pedal rises, start the engine and let it idle for 30 seconds. Turn the ignition switch to LOCK, and wait 30 seconds. Press the brake pedal several times using normal pressure. When the pedal is first pressed, it should be low. 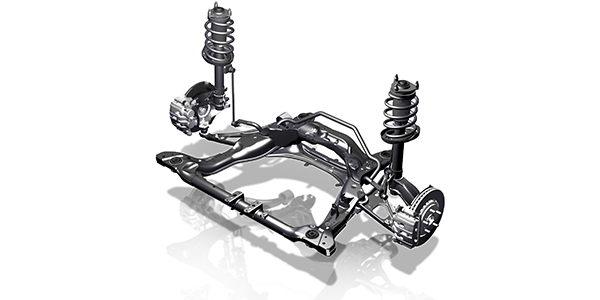 On consecutive applications, the pedal height should gradually rise. This is normal. If the pedal does not rise, inspect the check valve that is built into the vacuum hose going from the engine to the booster. With the engine running, pull the hose at the booster to confirm vacuum. If the check valve is faulty, replace the brake booster vacuum hose/check valve as an assembly. 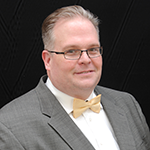 If the check valve is working and the brake pedal does not rise after several applications, it could be the booster or the master cylinder could be leaking internally. The Ridgeline has electronic brake distribution and brake assist. The brake assist system helps ensure that any driver can achieve the full braking potential of the vehicle by increasing brake system pressure in a panic situation, bringing the vehicle into a full ABS stop. If during a panic stop the VSA modulator-control unit determines that the brake system pressure increases above a threshold in less than a certain amount of time, the VSA modulator-control unit engages brake assist. Because the brake system pressure crossed the pressure threshold before the time threshold had expired, the VSA modulator-control unit goes into brake assist mode. When a brake assist event occurs on the Ridgeline, the customer may notice a change in the brake pedal height, such that the pedal may drop a little bit. This is normal.